Happy Pride! This weekend, between appliance shopping and finalizing the kitchen plans for our house renovations, I decided to make a rainbow cake. Back in April, I made this Care Bear cake for my nephew's birthday. 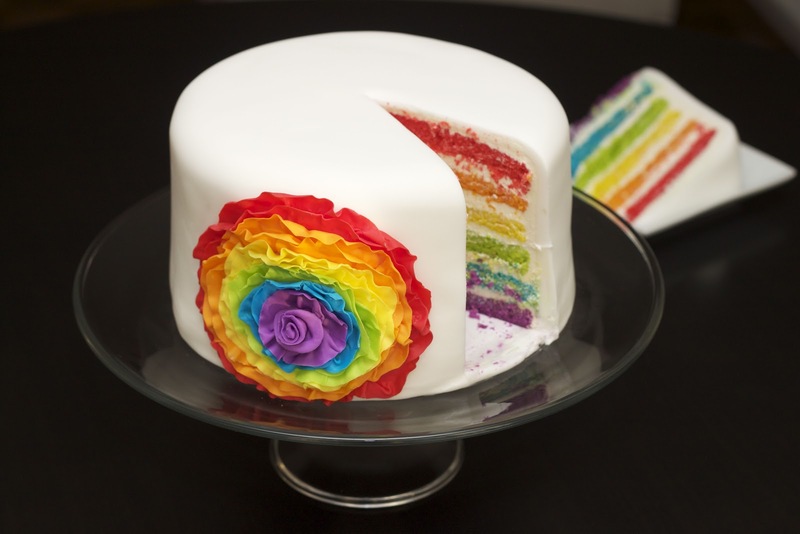 I posted a preview of the uncovered cake and a friend exclaimed, "It is a cake for the gays!" As such, I promised to make another rainbow-themed cake for June. 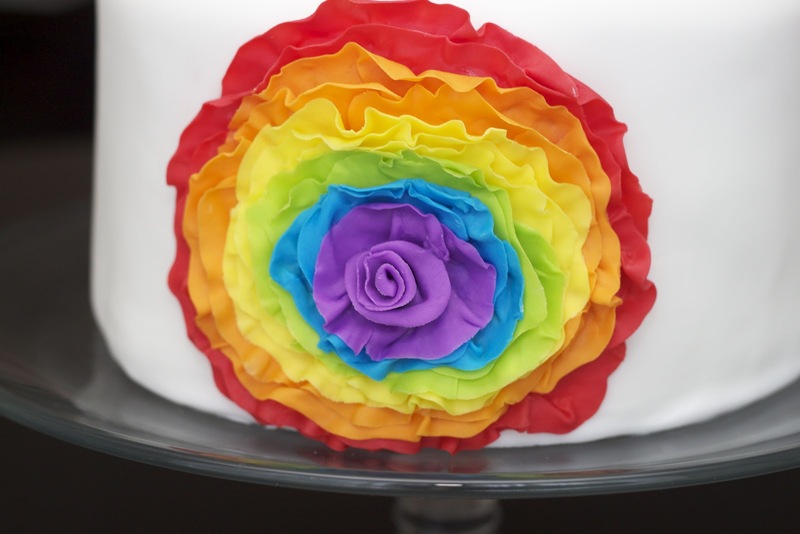 I wanted the cake to be simple so that the flower stood out i.e. no other decorations, and no border around the bottom. As such, it was really important to have a clean edge on the bottom of the cake. I decided to try something a bit different, and propped up my cake on a 6-inch styrofoam dummy so that I could cleanly cut away the excess fondant after covering it. This did not turn out very well. The fondant ended up stretching quite a bit due to the weight and because it was so thin, it was not going to be a smooth background for the flower. In retrospect, I should have covered the cake on a flat surface, trimmed away some of the excess, and then elevated it to cut the bottom edge cleanly with a paring knife. To fix the messy looking fondant, I actually rolled out another 2 pounds of fondant, brushed the already covered cake with cooled, boiled water and re-covered the cake. Yes, a bit of a pricey fix, but I really did not want a lumpy fondant job ruining the whole aesthetic of the cake. Besides, if I use up my fondant, it's one less thing I have to lug over to our new home. 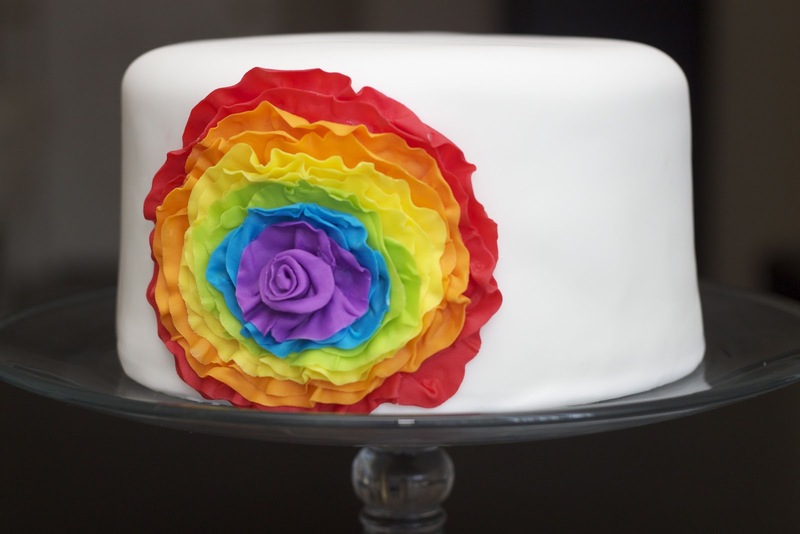 I have wanted to make a ruffled flower on a simple white cake for some time. This was the perfect opportunity to try this out in beautiful bright colours. It also gives a hint of what's to come upon cutting the cake. I tried a few different tools to ruffle the edges of strips cut from modelling paste. At first I tried a ball tool however I found that I would get too many areas that were too thin and I did not find the edges ruffled enough. By the second orange ruffle, I moved on to trying a cone tool. I thought that this produced a better ruffle but I felt that it made the edges of paste a bit rough and it was hard on the fingers. I went back to the ball tool for a bit and then I tried making the ruffles with a modelling stick. I think that the modelling stick was the easiest option. 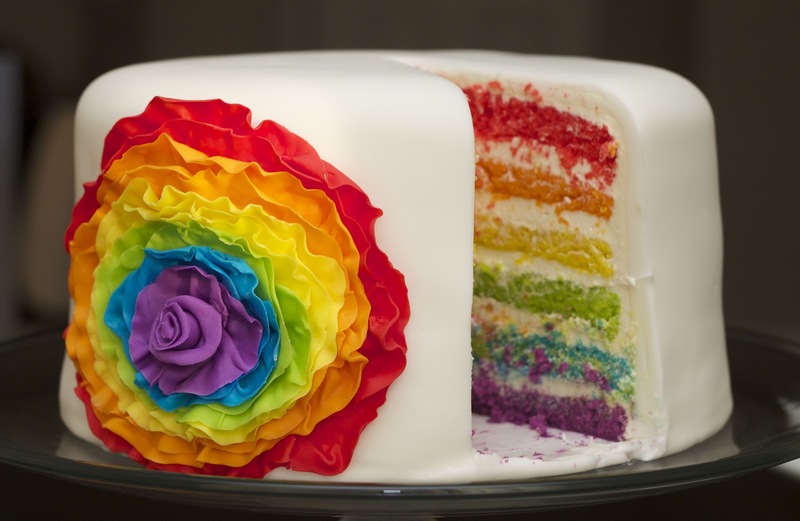 This was an 8-inch cake filled with an orange cream swiss meringue buttercream. To get the 'orange cream' flavour, I used vanilla extract, Cointreau and orange flavouring. The flavour was great, however, as this cake involves a lot of buttercream to fill the 6 layers and crumb coat the cake (I used 8 cups! ), a little goes a long way in terms of serving sizes! I hope that everyone had a wonderful Canada Day and Pride weekend! If you need to 'use up' more baking supplies I will gladly take a cake off your hands.